AlphaNinja: A forecaster you MUST be watching. In his January letter, Jeremy Grantham discussed several things, none of which was as important as the summary of his firm's 1999 asset class predictions. Grantham and his team's 1999 predictions for performance by asset class were beyond remarkable. 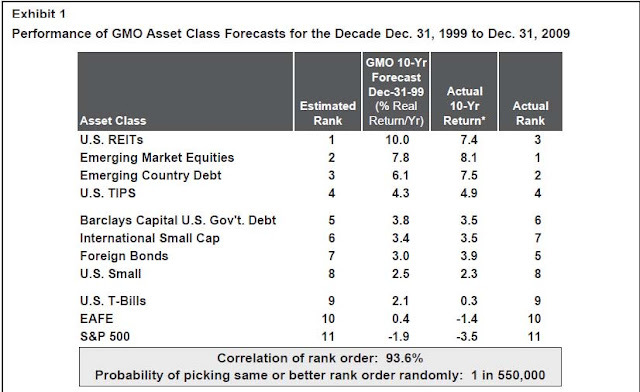 In fact, the probability of randomly picking asset class performance with GMO's degree of accuracy was 1 in 550,000. 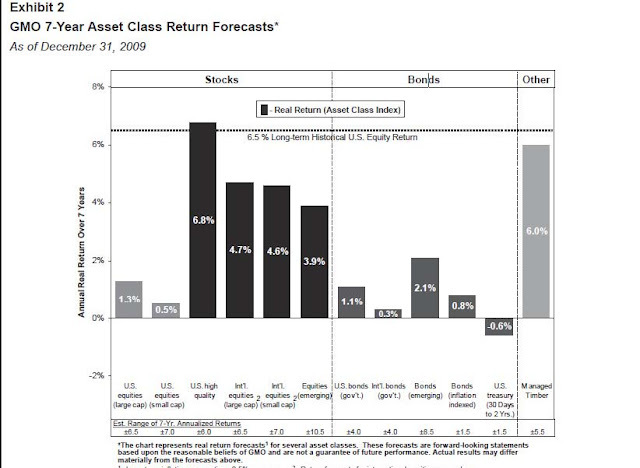 Not only the order of the returns was spot on, but the absolute performance by asset class was prescient. Importantly, Graham also shared their current outlook - this time it's for the coming 7 years instead of 10. Chalk that up to in-house discussions of how accurate they can be based on different time horizons. 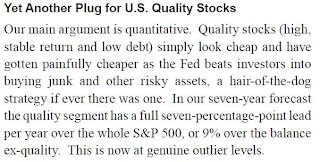 Anyone can participate with Grantham in his pursuit of high quality stocks, simply by owning their low-cost GQETX fund. A look at the top holdings shows that they are VERY similar to the DJIA industrials. Their strategy is similar to my own -->> buying excellent companies that have a Free Cash Flow Yield that is too far above their cost of capital, discussed in my 2010 outlook along with my DJIA price target.